The Kellogg Institute for the Training and Certification of Developmental Educators is the nation's oldest continuous advanced training program for developmental educators and learning skills specialists. A supervised practicum following the residency and carried out at the participant's home campus. SWT-TIDE is 5 days of mentoring and hands-on practice to hone your technology skills. Designed by and for developmental educators, you will have an opportunity to learn new technology skills, complete technology projects, and enjoy a technology vacation. Over 16 workshops are offered. Subjects include Word Processing, Databases, Spreadsheets, Multimedia Slideshows, Hypermedia, WWW pages, Creating On-line Courses, and other PC and Macintosh Topics. Founded by Drs. Martha Maxwell and Frank Christ, the Winter Institute serve a small number of participants (60) who experience a highly interactive learning environment with nationally known mentors and facilitators. Each Winter Institute is part of a series of intensive programs of presentations, small group mentoring, Special Interest Group meetings (SIGs), and participant dialogue on a theme relating to some aspect of learning assistance. The Winter Institutes are based on a teaching/learning philosophy created by Frank Christ. Winter Institutes are designed to provide participants with optimal learning experiences that can be translated into practical actions upon participants return to their institutions. Learning Center staff members are versatile, knowledgeable, and enthusiastic. Share these qualities through a submission to Academic Exchange Quarterly, a peer-refereed journal. The fall issue has pertinent themes of critical thinking and distance learning. Perhaps your learning center has a major role in distance education, even directly offering courses and/or academic support. Critical thinking encompasses all academic areas and is often a goal in student support. Share your knowledge with your peers. Deadline for the fall issue is July 5. The way to earn better grades is to; 1. refine, 2. master, and 3. apply the skills essential to learning. A first step in this 3-part process is awareness of the 9 essential tasks in learning. The Radial of Learning identifies the 9 essential tasks for earning excellent grades. As a diagnostic tool, students can compare what they do for each task to what needs to be done and quickly see where changes in study skills need to occur. Specific suggestions are made under each task based on the efficient and successful learning skills of "A" students. Learners may analyze their study skills by writing down what they do under each step in the Radial of Learning. Next, learners and/or instructors can compare that with what "A" learners do as listed in the Radial of Learning. This comparison will reveal those areas where there are differences between what each learner is doing and what "A" learners do. Learners can then seek the specific kind of study skills help they need or learning skills instructors/staff can immediately provide the precise kinds of information and practice that learners need. There is no waiting for time consuming scoring and interpretation of complex diagnostic tests. There are many ways to successfully perform each task in the Radial of Learning. Under each task are suggestions from "A" learners on how they do each task and earn A's. As Manager of College Survival for Houghton Mifflin, Sandra Ayaz leads a team of national education consultants specializing in student success courses and retention efforts. Sandi and her team work diligently to promote Becoming A Master Student and currently interact with over 3000 institutions across the United States and Canada. Dr. Ayaz previously served the education community as Executive Director of the Public Schools Enrichment Partnerships at Florida Gulf Coast University, as an adjunct instructor at Edison Community College, and as Assistant Director of the office of Minority Student Services at Florida Atlantic University where she was responsible for developing, implementing, and evaluating retention programs designed to assist the academic and personal success of undergraduate and graduate students. She directly monitored and coordinated programs including, but not limited to, tutorial, peer counseling, academic scholarship, leadership, and book loan programs. Dr. Ayaz also served as co-project director for the College Reach Out Program (CROP), a postsecondary education enhancement program provided to minority youth in consortium with local community colleges. Dr. Ayaz received her academic training from Santa Fe Community College and Florida Atlantic University earning a Bachelor’s Degree, a Master’s degree in English, and an Education Specialist Degree in Education Leadership. She most recently completed a Doctoral Degree in Adult Education with a special emphasis on the effects of accelerated learning and multiple modalities sensitive instruction on kinesthetic learners and multicultural populations. Dr. Ayaz is a member of the International Mentoring Association, the National Association of Developmental Education, the College Reading and Learning Association, and the American Association of Higher Education. She is a member of Sigma Tau Delta, Phi Kappa Phi, and Phi Theta Kappa honour societies. Dr. Ayaz currently serves as President of the National Tutoring Association. She has received the Omega Psi Phi Distinguished Faculty Award, the Karl F. Ijams Humanitarian Award, the FAU Student Affairs Distinguished Service Award, and the State of Florida Davis Productivity Award. Dr. Ayaz speaks nationally regarding tutoring, communications, multiculturalism, leadership, and personal survival. She is the author of Contemporary Sanguines: The Metamorphosis of the Vampire Myth in Literature and co-author of Hitching A Ride to Success: A Roadmap For Collegiate Travelers. Dr. Sandra Ayaz is married to her husband of nearly ten years, Mehmet Ayaz. In her spare time, Sandi enjoys entertaining and nurturing her pet rabbit named Elvis. Congratulations to Sandi on her impressive record, and our deep thanks for her continued contributions to the learning assistance community. This first joint symposium co-sponsored by NADE and CRLA will consist of twenty-one three-hour, interactive presentations on major issues affecting Learning Assistance and Developmental Education. The idea is to have time to discuss the issues in depth, and perhaps even decide some of the future directions and definitive roles for learning assistance professionals. Nearly 1,000 representatives from over 800 colleges and universities attended last year's conference. This year the conference offers more than 100 workshops in five tracks. Identify the latest strategies for retention success, and review successful practices for recruitment and financial aid. Windows include some great utilities for keeping your PC optimized. These include ScanDisk, Disk Defragmenter, and Disk Cleanup. We will look at each one of these and show you how to automate their use. To access these utilities, use the Windows "Start" button, and point to Program, Accessories, System Tools, then the utility name. Use ScanDisk to check for and fix errors on your hard drive. Start by selecting the drives you want to test. Select more than one drive by keeping the <Ctrl> key down while clicking on the drive names in the selection window. Next select type of test. The "Standard" test is a quick test of directory structure, while the thorough test adds a hard drive surface scan and may take hours to complete. Using programs on your computer will interrupt the test and cause it to start over, so only run the thorough test when you will not be using your computer for a long while such as overnight. Make sure the check box "Automatically fix errors" is checked. Otherwise the program will stop when it encounters an error and wait for you to instruct it on how to handle it. Since in most cases you want to run the check while you're away from your computer, you will need to check this box and have errors fixed automatically. When you're ready click on the "Start" button. Use Disk Cleanup to free up hard drive space. Disk Cleanup will identify and remove temporary files, Internet cache files, and other unnecessary program files that you can safely delete. When you launch Disk Cleanup a dialog box will allow you to select the drive. Click on "OK" and Windows will search the selected drive and display a list of files it can delete. You have the option of checking which type of files to delete (e.g. Internet temp files, Recycle bin, Windows Temp files, etc.). Each time you check or uncheck a selection, Windows will calculate the amount of space you will gain by deleting the selected files. When you're ready to proceed, click on "OK" to remove the files. Using Disk Defragmenter regularly will speed up access to your files. As you delete and add new files to your hard drive, the new files become fragmented. Here is a simplified example on how this might happen. Let's say you delete 100 KB file, and this file was physically located at the beginning of the hard drive. A little later you install a new file that is 300 KB in size. Windows will copy the first 100 KB into the empty area where the deleted file used to exist, and the other 200 KB in another empty area on the hard drive. So now a fragment of the new 300 KB file physically resides at the beginning of the hard drive, while the rest resides somewhere else. To read this file, the hard drive heads must move around different areas of the disk hunting for the different fragments, and that slows down performance. To rearrange your file segments so they reside next to each other, run Disk Defragmenter and select the drive. Click on "OK". You will see a progress window. Click on "Show Details" to see a graphical map of your file clusters and how Disk Defragmenter in moving them around. Warning, this map can be mesmerizing and you may find yourself spending a lot of time staring into it! If you have a large hard drive and it has been a while since you defragmented it, the process may take a long time. 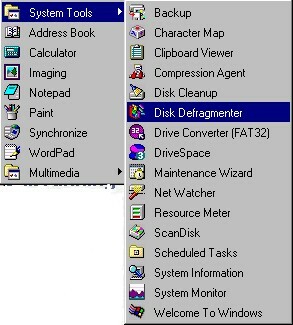 You can use your computer while the defragmenter is running, however, your computer will be slow and the defragmentation process will start over every time you disturb the files. Thus it's better to run Disk Defragmenter before going to lunch or other long breaks. To keep your system at peek performance, you should run the above utilities periodically. As we mentioned above, ScanDisk and Disk Defragmenter may take a long time to finish, and it's best not to use your computer while running them. So how can you run these tasks without interrupting your work? The answer is to run them during your off hours, say at midnight for example. Luckily, you don't have to stay up till midnight to start these tasks. Windows has a utility that will schedule these maintenance tasks while you are away. To run this utility, use the Windows "Start" button, Program, Accessories, System Tools, then "Maintenance Wizard". The Maintenance Wizard will let you select the maintenance utilities discussed above, and select the days of the week and time to run them. For example, you can set the wizard to run ScanDisk midnight on Mondays and Wednesdays, and run Disk Defragmenter midnight on Tuesdays and Thursdays. Obviously, you will need to leave your computer on during the scheduled times to enable Windows to run the scheduled tasks. If you don't like to do that often, then schedule all your maintenance tasks for one night a week. For example, schedule Clean Disk at midnight, ScanDisk at 1 AM, and Disk Defragmenter at 3:00 AM on Tuesday morning, and leave your computer on Monday night / Tuesday morning. Switch your screen saver off so it does not interrupt the maintenance process, and simply switch your monitor off before leaving. One day a little girl came home from school, and said to her mother, "Mommy, today in school I was punished for something that I didn't do." The mother exclaimed, "But that's terrible! I'm going to have a talk with your teacher about this! But by the way, what was it that you didn't do?" A English professor wrote the sentence "Woman without her man is nothing" on the blackboard and directed her students to correct it. The guys wrote "Woman, without her man, is nothing." The girls wrote "Woman! Without her, man is nothing!" "I try not to let my schooling interfere with my education." "I learned three important things in college---to use a library, to memorize quickly and visually, and to drop asleep at any time given a horizontal surface and fifteen minutes." "There are costs and risks to a program of action, but they are far less than the long-range risks and costs of comfortable inaction." "Few things help an individual more than to place responsibility upon him and to let him know that you trust him." "In a moment of decision, the best thing you can do is the right thing to do. The worst thing you can do is nothing." "The shortest way to do many things is to do one thing at a time." Submitting articles of interest to learning assistance professionals. This newsletter is produced by Mon Nasser from Engineerica Systems, Inc. My thanks to Dennis H. Congos and Maureen Connolly for contributing to this issue, and to Sandi Ayaz, our June Person of the Month. The National Tutoring Association conference in San Antonio, TX. Educational Clip Art on the net. May's Person of the Month. Using the Windows Character Map. Quotes by Benjamin Franklin, Aristotle, and others. To read the May issue, click here. Please tell your peers about this newsletter by forwarding its web address to them.